Our Agents program is easy, flexible and with free membership for bonafide travel agents and tour operators globally. If you have a strong presence amongst small business owners/customers through your website, email contacts or social networks, joining our Agents program could be a great way for you to generate extra revenue. There’s no commitment, no monthly sales quota, and it’s 100% free. You can generate as many bookings from your resources – sell luxury train thru our website and other contact resources of yours. Total flexibility. Unlimited earning potential. *Free to join. 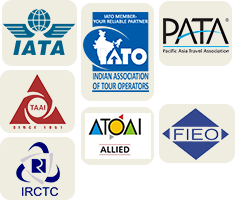 By joining our agent programme exclusively formulated for Friends of Travel Fraternity (FOTO benefits), besides enjoying the Loyalty Rewards under Loyalty Club programme, you being a travel agent/tour operator, will also be entitled for extra financial benefits on the generated bookings of luxury trains ( viz. Palace on Wheels, Royal Rajasthan on Wheels, Maharaja Express, Deccan Odyssey, and Golden Chariot) when booked thru The Luxury Trains of India (LTI).